Lac La Hache Provincial Park offers volunteer host opportunities. 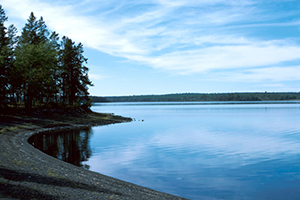 Lac La Hache is one of the most popular recreation lakes along Highway 97. There are many stories to explain how the lake was named; according to one, it gained its name when a trapper lost his only hatchet axe when chopping a hole in the frozen lake. This area is rich in tales of fur traders, gold seekers and cattle ranchers. By the 1860’s, gold fever was running high, as miners searched for the motherlode first near Likely, and later at Barkerville. With teams of horses, mules and oxen, the fortune-seekers plodded north along the Cariboo Wagon Road skirting the eastern shores of the lake. Nowadays, Lac La Hache Park is a stopping point for weary travellers. Set amongst a stately Douglas-fir forest, the cool, green conifers shade campers from the hot Cariboo sun. Lac La Hache Park is located on Highway 97, 13 km north of the community of Lac La Hache. Established in 1956, with 83 campsites, flush toilets, tap water, a sani-station and a self-guided nature trail, Lac La Hache Park is a very pleasant campground. The day-use area is located across Highway 97 on the shore of Lac La Hache and has an adventure playground, picnic tables, picnic shelter, boat launch, developed beach, changehouse and flush toilets. This is an excellent fishing lake for Kokanee and lake trout, as well as rainbow trout and burbot during the summer months. However, fishing need not be your only recreational pursuit, as the lake is also a popular place for power boating and water-skiing. The Heritage House at 108 Mile is a half-hour’s drive from the campground, and is open from May to September. The campground host or Park Operator can inform you of other things to do in the area, as well as boat rental locations. The community of Lac La Hache offers a grocery store, gas station, bakery, ice cream parlour and a few restaurants. Swimmer’s Itch can sometimes be a problem in mid-summer. Ensure you and your kids shower off and towel down thoroughly after swimming in Lac La Hache. Calamine lotion is an effective treatment. Highway 97 runs between the campground and the day-use area. Ensure young children are accompanied at all times. Prevent the spread of Eurasian water milfoil, an aquatic weed. This invasive foreign species can be introduced by pieces of the weed adhering to your boat’s hull or propeller after you have visited lakes where it is present. Please ensure your boat is clean of all vegetation before you launch it in Lac La Hache. The park is 13 km north of Lac La Hache community on Highway 97. The closest communities, towns and cities are Lac la Hache and 100 Mile House. History: The historic Cariboo Wagon road runs through the park. This was originally just a trail used by fur traders from 1803 to 1810. During the Cariboo Gold Rush of the 1860’s it was rebuilt, and it linked the gold fields of the Cariboo to the gold markets of the world, via the shipyards of Vancouver. One of the stops on the park’s Interpretive Trail is on the actual Wagon Road. The overgrown track seems a far cry from our modern Highway 97. One of the stopping points on the Wagon Road for weary miners was the Blue Tent Ranch. It was built by the Wright family in 1862, after they discovered that cattle and the roadhouse provided a much steadier income than gold mining. The present day park is located on part of the original ranch land. Throughout the park, you can see the stumps from the lumber used to build the original ranch house. This heritage house still stands today, and can be seen next to the highway, roughly three kilometres north of the park. Lac La Hache was established as a Class A Provincial Park in 1956. Cultural Heritage: Both the Shuswap and Chilcotin First Nations used the area. Long before the lure of wealth brought the fur traders west, the Shuswap Indians established pit houses near the present day village of Lac La Hache. The Chilcotins named the lake Kumatakwa, meaning Chief or Queen of the waters. Conservation: The park is in the Interior Douglas Fir Zone, which is found in BC’s dry interior. There is a superb old-growth stand of Douglas-fir trees surrounding the campground. A fire in the 1960’s burned several hectares, and you can still see the scars on the bases of some fir trees, their thick bark allowed these trees to survive. Fire is part of natural succession here – sunlight reaching the forest floor allows the growth of trembling aspen and lodgepole pine, as well as pinegrass, bunchberry and beautiful pink wild roses. Wildlife: Birds that thrive in this lakeside habitat include bald eagle, osprey and red-tailed hawk, as well as forest birds such as pileated woodpeckers, saw-whet owls, red crossbills, chickadees and nuthatches. Because of the diversity in plant species, a wide variety of mammals lives in this area, from moose and black bears to humble shrews and chipmunks. There are also mule deer, pine martin, lynx, and flying squirrels. Canoeing and kayaking are enjoyable activities on Lac La Hache. However, the lake is also used for power-boating and water-skiing. This is an excellent fishing lake for Kokanee and lake trout, as well as rainbow trout and burbot during the summer months. Anyone fishing or angling in British Columbia must have an appropriate licence. The Wagon Road Self-Guided Nature Trail is 2 km in length. It leads visitors on a voyage of discovery – from the ingenious eating habits of red crossbills to the Gold Rush history of the area. For your own safety and the preservation of the park, obey posted signs and keep to designated trails. Shortcutting trails destroys plant life and soil structure. There are no lifeguards on duty at provincial parks. A wide, sandy beach welcomes summer visitors and an area is roped off for swimming. Changing rooms, an open air shower and washrooms are provided. Lac la Hache is a popular lake for waterskiing. A double-wide, cement ramp boat launch is provided at the day-use area. Waterskiing is very popular at Lac La Hache. Cold water taps are located throughout the park. Taps are shut off during the off-season. There are no hose hookups for campers/trailers. This park has a day-use/picnic area. There is a covered shelter with picnic tables and a wood stove, change houses, pit and flush toilets, cold water taps, and fire pits. There is also an adventure playground in the day-use area and horseshoe pits located in the campground. The gate to the day-use area is locked between 11pm and 8am. There is an adventure playground in the day-use area near the beach. A sani-station/dump is available during the collecting season. This park offers vehicle accessible campsites. These range in size with many larger sites including a few pull through sites. There are also around 10 sites that have tent pads. However, there are no double sites. The sites are nestled amongst the trees and most are large enough to accommodate for extra vehicles. Campsite reservations are available at this park and first-come, first-served sites are also available. See the above map for more information. If staff are not around when you arrive at the campground, choose your site and pay later. Staff will be at the campground at least once a day during the camping season. There is a pay phone located at the campground entrance and the closest store is across the highway at the Crystal Springs Resort. Any non-reservable site for the full season. A minimum of 4 consecutive weeks must be booked. Please contact the Park Operator for information and to book one of these sites. Some facilities in the park are wheelchair accessible. The flush toilet buildings have wheelchair accessible stalls.